With the recent ban of Vaxxed from Tribeca Film Festival, this could be the most political game you've played in years. Go bomb those lab prisons! Apestorm Full Bananas is a new 2D steampunk side-scrolling shooter, which puts you in control of a zeppelin on a killing spree. 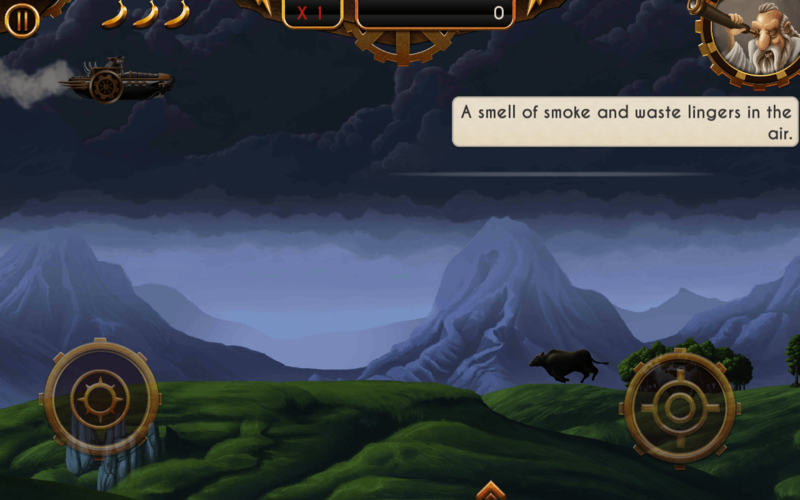 We got our hand on the newly released indie game, and here is what we think. First of all, the story is just fun to follow if you have enjoyed the movies like Dawn of The Planet of The Apes. We the humans have been destroying the planet for too long, and abused our fellow creatures by torturing them in big pharma labs, and exterminating them in genocidal crusades for centuries. This is not to mention the domestic violence of bestial proportions with which some “masters” treat their “pets.” Many species have gone extinct, others are vanishing rapidly. 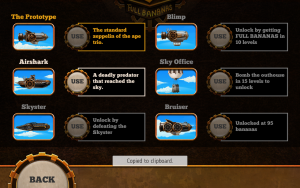 Apestorm Full Bananas tells a fantasy story of three apes that escaped a torture lab, and stole a steampunk zeppelin. Their mission is to free the other animals tortured and enslaved by humans. A side-mission is to also destroy the humans. Good start. 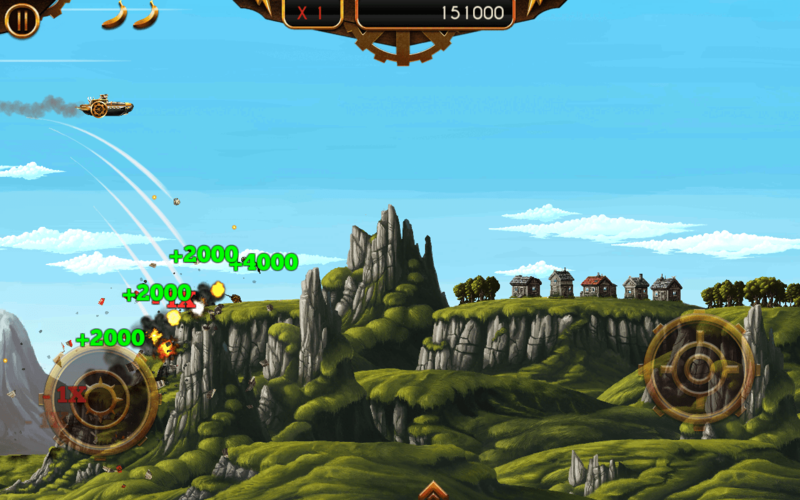 The zeppelin flies across various landscapes and shoots bombs when you command it to. The controls are simple, yet suggest a slight learning curve as the game mechanics take into account many realistic factors. On your left, there is a steering joystick you use to gain speed and slow down, go up and down. On your right, there is a bomb launching button. Where the bombs land depend on your zeppelin’s speed and altitude. Simple as that, but it will take you a few tries to see what you can do with the controls. For example, you can not go back, but you can come to a near full stop if you go abruptly down and drop your speed at the same time. The faster you go, the farther will the bombs land. The higher you fly, the longer is the bomb’s trajectory. It would have been a complete mess of an aiming if it weren’t for the small arrow pointer at the bottom of the screen, which indicates approximately where your bombs will land at your current speed and altitude. Just keep an eye on that and you’ll get the hang of the mechanics. It’s really not that difficult to learn how to aim here, and I’ve seen my first-grade nephew master the controls faster than I did. The challenge comes from everything else. 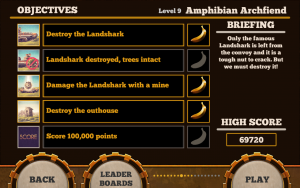 Each stage has five objectives, and completing each of them gives you one banana. The challenges are more or less the same throughout the stages, but their values increase. For example, you need to score X points; destroy no trees or birds or animals; free all caged animals; destroy all buildings; destroy military vehicles and warehouses; destroy special buildings. That’s where it gets whacky. As you fly, there are many things below you – trees, and caged cows or apes, giant tree-burning droid spiders, military buildings, tanks, air defense systems, towers, and warehouses. Your objective is to save the animals, spare the trees and birds, and destroy everything else. This is easier said than done since everything is mixed up and precision aiming is required. You need to be ready to change your speed and altitude on the go, maneuver to avoid being shot down, slow down to aim at the cage or fence without killing the animals inside it, or try to hit a small house in the middle of the trees and two mountain peaks without hitting the mountains or burning the trees. Scoring as many bananas as you can in each stage is important because the said bananas unlock new levels, power-ups and more zeppelins. Go to the Extras from the game;s main screen to take a look at the other zeppelins you will be able to unlock as you play. You unlock it just by reaching an X number of bananas, you don’t need to pay in bananas to unlock it, which is great. The same is true about the power-ups, you just unlock them by scoring X amount of bananas. 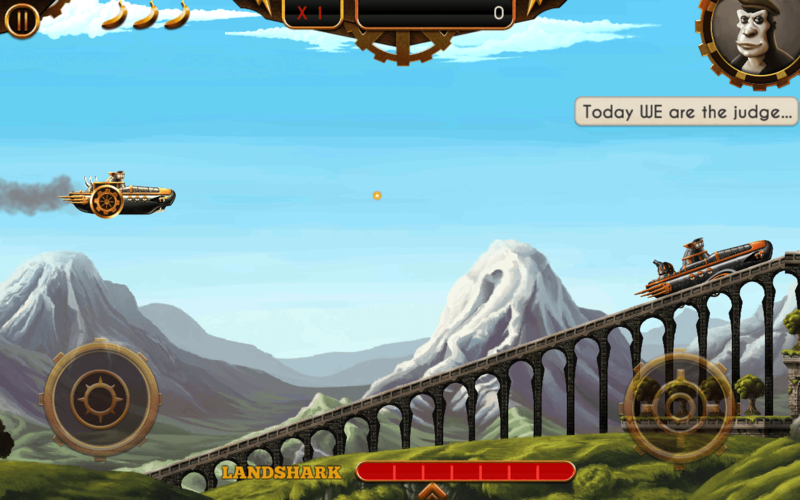 However, power-ups are more capricious and need to be caught in air. They are the small crates tied to balloons you need to catch in the middle of the mayhem if each stage. Once you catch the power-up crate, the power-up ability gets activated immediately and lasts only a small fraction of the stage. Sometimes, the power-ups are not something you need at a given piece of the landscape. For example, if it’s a shell bomb you don’t want to deploy it in an area heavily populated by caged animals and trees because each animal and tree you hit chips away large chunks from your high score. 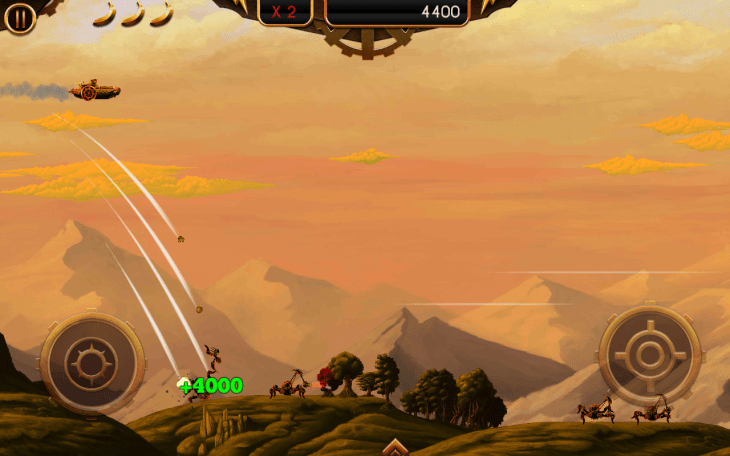 Likewise, sometimes power-ups float in the midst of heavy air defense shootings, so trying to get it becomes suicidal. The greatest woe, however, is that the power-ups are one-time consumables you can not activate when you need it. Truth be told, it chips away from the fun factor and does not really give you a sense of accomplishment when you unlock a new power-up simply because you don’t get to use it at your own will, but quite randomly and in most cases based on luck. I would change that. 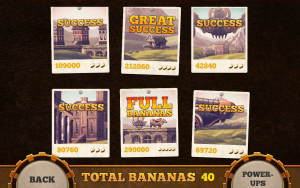 Finally, X number of bananas unlock new stages, and there are some 20 levels with quite a great replay value. First of all, you don’t need to grind one and the same level till perfection. You can go on playing other levels and unlocking more power-ups, and then get back to that finicky stage and deal with it with less effort. 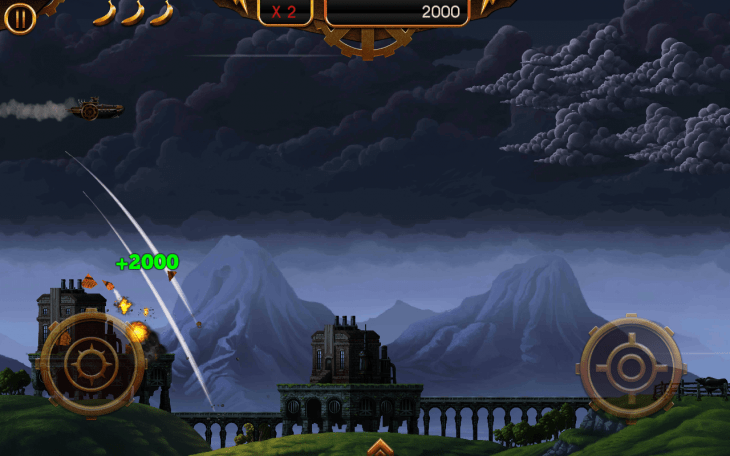 That said, the game’s difficulty is moderate to high, with only the initial levels being easy. The design is very detailed, polished and turns out to be “deeper” than first meets the eye, especially if you judge by the screenshots. I loved the backgrounds, and all the little details that went into creating the atmosphere – the wind, or lightning, birds, and clouds, shadows and the grass shades. The sound score is great, and occasionally you get to hear the apes cheering as you make progress. The game features two cut scenes – an introduction about the destruction of the planet’s eco system, and the three monkeys escaping the lab. The ending scene reveals how the story ends, and I am really looking forward to unlocking it. Not only because there is something in the story that hooked me, but also because I dig the art style. As for the story, I hope the “scientists” who torture animals and people will get what they deserve. I have not experienced any performance issues with Apestorm Full Bananas but for my device getting quite hot during the gameplay. A fact that was immediately outweighed by the ability to play offline, or completely deny the game the access to the Internet via a firewall app. I have seen some reviews on Google Play of users complaining about the game requiring permissions to access the media storage of the device. It would be nice of the developers to explain the permission, but as for those who have doubts, just use a firewall app and rest assured the unauthorized apps and games won’t leak your data to any third party. If you want to score high on the leaderboards and share your results via social networks, however, you will have to use the connection and share the stats with your Facebook. 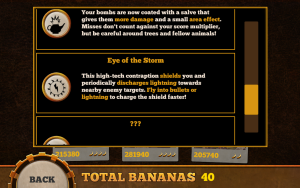 Apestorm Full Bananas is a quality premium game with very decent replay value. 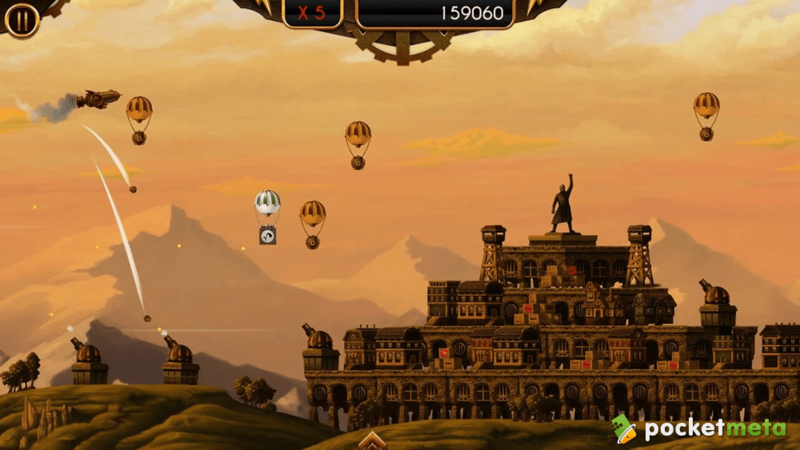 If you enjoy beautiful steampunk art style, meaningful yet challenging controls and mechanics, and a good story to go with it, grab Apestorm Full Bananas while it’s on sale. It will test your hand – eye coordination, reflexes and learning abilities. It’s easy to recommend. 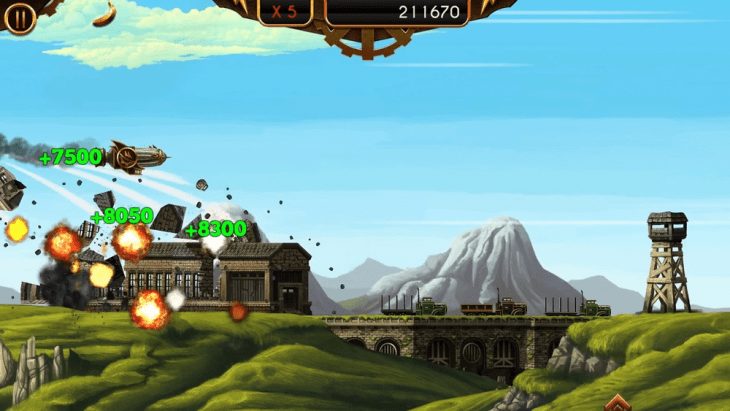 Apestorm Full Bananas by Snowhound and All 4 Games is a new 2D steampunk side-scrolling shooter that has you bombing big pharma labs and liberating animals.